Are you new to poker or a struggling poker player? Do you want to be a profitable poker player? Do you want to learn how to crush the micro stakes? If so, this course is for you. This course will teach you everything you need to know to crush micro stakes online poker and turn nickels, dimes and quarters into hundreds of dollars of profit. I have won over $800 in the past year only playing $2, $5, and $10 buy-in micro stakes cash games in my spare time and I'm going to show you how to do so as well! 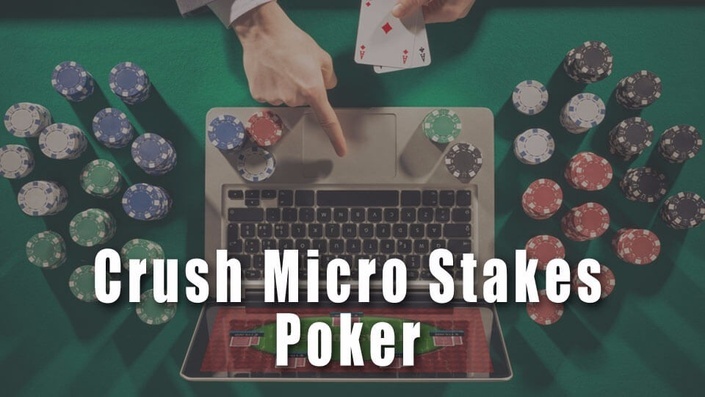 In this course you'll learn everything you need to know to crush online micro stakes poker. I will teach you how a tight-aggressive approach to the game that yields tons of profits through a fundamental understanding of poker strategy and tactics. If you are a beginning poker player who wants to maximize your winnings or even if you are an experienced and struggling poker player that doesn't feel you are doing the best you can, this course is for you! Through over 100 High Definition (HD) video lectures and 12 hours of learning material, you'll learn everything you need to know to crush micro stakes online poker. Once you complete this course, you will be a fierce adversary and feared opponent at the poker table and will easily be able to crush micro stakes online poker. You will not only win a lot more money at the poker tables, but you'll also be a much happier poker player as you see your profits skyrocket throughout the year! JOIN THOUSANDS OF STUDENTS LEARNING HOW TO CRUSH THE MICRO STAKES AND BECOME A WINNING POKER PLAYER! Over 100 lectures and 13 hours of content! One of the most comprehensive poker courses available on the Internet! This course is designed for beginning or struggling poker players that are having difficulties beating online micro stakes No Limit Holdem poker. This course is NOT for experience poker players that can easily beat the micro stakes.